A few weeks ago, the Rev. Calvin O. Butts III, the influential pastor of the Abyssinian Baptist Church in Harlem, came to a difficult decision, one he had wrestled with all summer. He would not endorse William C. Thompson Jr., the city comptroller and a longtime friend and ally, for mayor, as he had promised Mr. Thompson last spring. Instead, he would endorse Mayor Michael R. Bloomberg. Mr. Thompson was furious at the betrayal. But what he did not know was that Mr. Bloomberg gave a $1 million donation to the church’s development corporation — roughly 10 percent of its annual budget — with the implicit promise of more to come. “What could I say to a man who was mayor, and was supportive of a lot of programs that are important to me?” Mr. Butts said in an interview before he endorsed Mr. Bloomberg. In his quest for a third term, Mr. Bloomberg has deprived Mr. Thompson of what many once regarded as his political birthright: the blessings of the city’s most powerful black ministers, who together preach to tens of thousands of congregants each week. And to win them over, he has deployed an unusual combination of city money, private philanthropy, political appointments and personal attention, creating a web of ties to black clergy members that is virtually unheard of for a white elected official in New York City. Some prominent ministers have been appointed by Mr. Bloomberg to influential city boards and committees. Others have enjoyed the administration’s help in buying city property or winning zoning concessions for pet projects. A few of the largest institutions, including Abyssinian and the Greater Allen A.M.E. Cathedral in Jamaica, Queens, have taken in millions of dollars in contracts to provide city services during Mr. Bloomberg’s eight years in office. Looming over it all is Mr. Bloomberg’s dazzling wealth, whether already bestowed — as in the case of Mr. Butts — or hoped for down the line. Those who support Mr. Bloomberg say that the mayor has earned their endorsements strictly on the merits of his record in office, especially on education and crime. But some critics say the outpouring of support owes more to the dependence of many black churches on a friendly ear at City Hall. 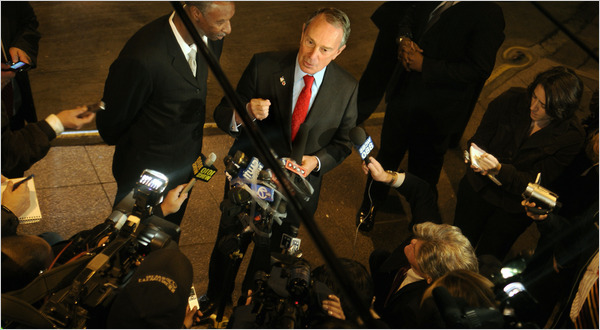 Aides to Mr. Bloomberg say that mutual respect, not financial ties, binds the mayor to the clergymen; they point out that some of the churches also received large contracts before Mr. Bloomberg took office. At moments of racial tension that might have swamped a different white mayor, Mr. Bloomberg has rarely faced the kind of personal criticism from prominent black ministers that wounded his predecessors, like Rudolph W. Giuliani, whom Mr. Butts once publicly branded a racist. Several black elected officials immediately denounced the comments as race-baiting. But no prominent black pastors demanded that the mayor disavow the comments. It seems to be inadequately appreciated that Bloomberg’s Bloomberg LP does business with almost every major company in the city. Most of Bloomberg’s wealth comes from the sale of the Bloomberg financial terminals, not from his media company activities. A lot of media companies are not doing well these days. It is Bloomberg’s terminal sales that are likely financing his recently announced acquisition from McGraw Hill of “Business Week,” competing business publication that like a lot of others has not done very well recently. Bloomberg considers the Business Week brand a strong draw on business people and newsmakers, two audiences that would complement its stranglehold on the Wall Street/investor type. Not only would it enhance access to newsmakers and help the company break news, it would also give Bloomberg a fresh subscriber list with new potential clients to sell its terminal. While Bloomberg LP is doing business with every major company in the city, the city is busily granting companies concessions over which Bloomberg’s administration has substantial discretion. In a 2002 agreement with the conflicts board, the mayor promised to limit his involvement with his company to major decisions that would have a significant impact on his ownership value. Throughout his two terms, the mayor repeatedly insisted that he had no involvement in the firm’s day-to-day operations. However, The New York Times reported that the mayor talked regularly to senior officials at the company about topics ranging from new data terminal sales to expansion into new markets and the general financial performance of the company. He even recruited the company’s spokeswoman. The Conflicts of Interest Board’s 2007 opinion is specifically about accommodating the mayor in the continuing acquisition of more wealth. Results speaking for themselves, that is something he had already done very well throughout his administration. Rather than generously giving money away, Bloomberg “donates” money to acquire more personal power and perhaps to acquire still more money as well. It even turns out he is driving up public expenditures on mayoral campaigns! Whereas once upon a time we were told we were going to have a mayor who was so angelically generous that we didn’t have to worry about anything, we now find that we have a mayor so financially omnipresent and capable of corrupting charity that we need to worry about everything. Setting aside conflict-of-interest abuse of charities to enhance personal power, there is also simply the question of Bloomberg’s possible conflict-of-interest abuse to enhance his wealth at taxpayer expense. It should not be disregarded. The possibility that Bloomberg’s terminal business could involve conflict-of-interest problems got some attention in a January 2002 New York Times article (before the Conflicts of Interest Board ruling) which is almost laughable in the way that it fails to identify the greatest possibilities for conflict-of-interest concern. Albeit that product placement and reputational capital idea is a valid concern, what goes unstated in the article is the slightest thought that placing the terminals on “the public stage as an object of desire” can also send a clear message about how easy it could be to deliver benefits equivalent to a kick-back. the mayor talked regularly to senior officials at the company about topics ranging from new data terminal sales . . . . But increased sales do not correspond in arithmetic proportion to increases in profit. The industry is somewhat of a diminishing marginal cost business; after a point, most costs have been paid for, so sale of each additional terminal beyond that point is essentially gravy. The donations are not an attempt to further market the Bloomberg name, his aides said. ”It was just the fastest way to get the office set up with computers,” said William T. Cunningham, the mayor’s communications director, who added that the system is the one that Mr. Bloomberg is most comfortable with. The new hardware lets users get e-mail messages, do word processing, make spreadsheets, surf the Internet, as well as gain access to the news services and financial market data typically offered to Bloomberg customers, all without the bother of flipping between windows on a single screen. Early Bloomberg users needed to pick their way around the terminals using arcane commands and interfaces, many of which persist today. Mr. Bloomberg believed that once people were trained in how to use a Bloomberg terminal, no matter how confusing, it would make them less inclined to switch to other systems. He also insisted that every new service or data point be bundled inside the Bloomberg and never sold separately, increasing the value of the machine and allowing the company to charge a premium to use one. Given the lack of separation between Bloomberg business interests and Wall Street, we must inevitably speculate skeptically about poor financial leadership of the Bloomberg administration. Should anyone feel confident of sufficient separation between the worlds of big mega deal city administration assisted real estate development and the Bloomberg private wealth businesses that are growing so fast. The answer is no, given the troubling conflicts we see at the highest level of the Bloomberg’s administration and business involving Daniel Doctoroff, Patricia Harris and Michael Bloomberg himself. Michael Bloomberg emerged from the primal ooze that is Wall Street to dominate New York as nobody else ever has, not even the Rockefeller brothers. We are told repeatedly that he is headed for certain victory. Well that’s why we still have elections. People understand Wall Street’s culture of greed and corruption far better today than they did before the meltdown, but few of us who aren’t in the game understand the mechanisms by which they leverage their political power to avoid regulation—the better to steal our money. Sure, we get the big picture, the fraudulent credit default swaps, the fraudulent credit ratings for the worthless securities, the collaterized debt obligations, and all the rest of it, but we haven’t read anything quite as revealing and frankly, quite as scary as this piece in Rolling Stone. If you can bear it, read it. We promise you’ll come away with a deeper understanding of just how crooked and menacing and yes, treasonous this crowd really is, and how hard it will be to take back our country, let alone our city. According to a new analysis conducted by the New York City Coalition Against Hunger, pilot anti-poverty programs initiated by Mayor Michael Bloomberg aided only 3 percent of New Yorkers in poverty. The figure rounds out to about one in 33. The announcement was made during a press conference on Tuesday, backed up by numbers from the U.S. Census Bureau, indicating that more than 1.5 million New Yorkers lived in poverty in 2008 – enough to fill Yankee Stadium 25 times. Do You Really Think Bloomberg Even Sees Working Class or Poor or Homeless People, Much Less Wants to Help Them? Raising the marginal tax rate on high income New Yorkers, imposing a modest stock transfer tax, a very modest wealth tax, as exists in Switzerland and many other countries, or try any of the other ways to increase revenues and restore a modicum of sanity is beyond the pale. Except in the few months leading up to an election, in Bloomberg’s world, we are all held captive by a few hundred Wall Street mega millionaires and billionaires. Just try taking anything away from them, they’ll head for the rolling hills of Connecticut. The “last time I checked pharmaceutical executives don’t make a lot of money.” – Bloomberg, again. In fact, Abbott CEO Miles White took home $28.3 million last year. In the same neighborhood: Bristol-Myers Squibb CEO Jim Cornelius, with $21.7 million, and Johnson & Johnson’s Bill Weldon with another $23 million. Since that piece appeared, Bloomberg was caught charging rent to working poor families forced into homeless shelters, many driven there by Bloomberg’s Wall Street pals. Magnanimously though, the rent was never more than 50% of what they earned. When questioned about it, he said “they made me do it,” the “they” being Governor David Paterson’s administration. That one is right up there with the Espada/Montserrate explanations that they are doing what they’re doing to promote the interests of the people they represent. As for imposing accountability on those who work the loopholes and abuse the system, we won’t insult your intelligence by pointing out to whom those words apply. Filed under A Good Manager?, Reading List, ritztastic Permalink · Comments Off on Do You Really Think Bloomberg Even Sees Working Class or Poor or Homeless People, Much Less Wants to Help Them? * The City Room has slideshows of Thompson’s and Bloomberg’s campaign advisers. * The Post reports that Thompson and Bloomberg are fighting over paperwork for a police academy in Queens. * Elizabeth Benjamin reports that on Sept. 22, the New York County GOP received another $50,000 personal contribution from Mayor Bloomberg. * MTA Chairman Jay Walder says Bloomberg’s campaign pitch to make some crosstown buses free is nonsense because it’ll take fare revenues away from the MTA, which has already suffered a budget crisis and had to raise fares this year.